It has been a year since Katniss (Jennifer Lawrence) and Peeta (Josh Hutcherson) made their historic Hunger Games win. They are preparing to go on their victor’s tour of the districts to promote the next event. Katniss is, understandably, visibly shaken from her experience in the games. Her “romance” with Peeta is causing strains with Gale (Liam Hemsworth). She must sell her romance to the districts, and the Capitol, if she wants to avoid an all-out war between the government and the people. Much to President Snow’s (Donald Sutherland) disliking, Katniss’ performance in last year’s games has changed everything. People in the districts saw her saving Peeta as an act of defiance against the Capitol. As a result, the Peace Keepers have stepped up their patrols. Public floggings and executions are more prevalent. They are desperate to put down any ideas of revolution among the districts. If the Capitol wishes to remain in power, they must remove all hope from the people’s minds. This year’s event is the 75th year of the games. Every 25 years, to remember the lives lost while crushing the rebellion, a “Quarter Quell” is held. This is a special edition of the Hunger Games. New games director, Plutarch Heavensbee (Philip Seymour Hoffman) is going to take things up a notch, making this the most memorable games ever. For this year’s event, the tributes will be drawn from the victors in each district. This will pit proven killers against proven killers. For those of you who have not read the books, myself included, I will stop here. I don’t want to give anything away. Catching Fire picks up where The Hunger Games left off. And then takes it up a level. Actually, it takes it up several levels. Where the original focuses mainly on the action in the games themselves, this latest installment focuses more on what is going on behind the games. The real motivation for them. Jennifer Lawrence shines in this film. She brings the emotion to the screen, and it really is the focus of the film. She continues to prove her talent onscreen. While I enjoyed her in the first movie, she takes things even further in this one. Her Katniss is powerful and motivated while at the same time vulnerable and unsure of what to do. She deserves every bit of praise that is constantly heaped on her. The rest of the cast is there to support Katniss, as their characters do. They all do an excellent job. Woody Harrelson, Lenny Kravitz, and Elizabeth Banks, whose wardrobes are outrageous and amazing, are all back as Katniss and Peeta’s support team. The characters they brought to life in The Hunger Games are as brilliant now as they were then. Philip Seymour Hoffman’s character is perfect for him. It is similar to the roles he is typically cast in, and that is because he plays this character so well. You can tell there is something scheming going on with him, but you aren’t quite sure what he is up to. Not to leave out Josh Hutcherson, Liam Hemsworth, Stanley Tucci, and Donald Sutherland. They all deliver as expected and should not be forgotten. This is one of the few films where, while leaving the screening, we discussed that it would be worth waiting in line for the midnight showing. Whether you read the books or not, you won’t be disappointed by Catching Fire. 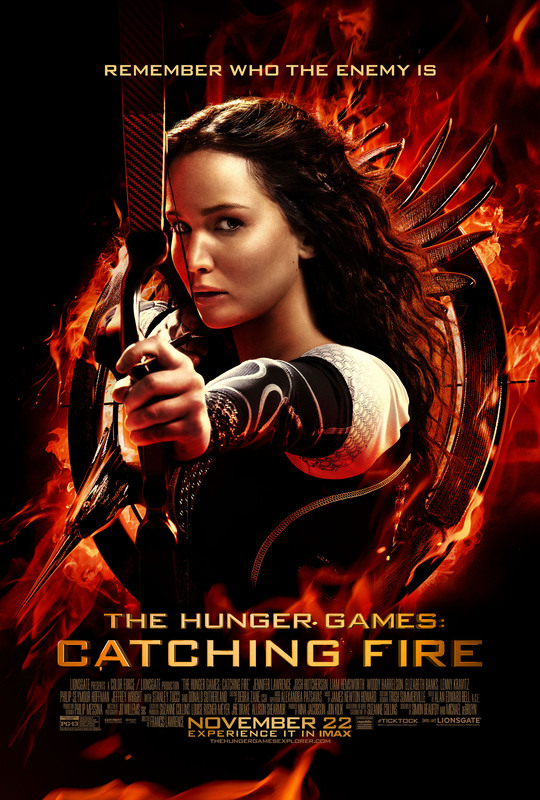 I would definitely recommend you see The Hunger Games, if you haven’t already. Otherwise you will be completely lost. I’m excited to see what they do with the final film. If they continue this trajectory, Mocking Jay (which looks to be following the standard of splitting the final installment into 2 episodes) will be amazing. Good review Bailey. Not perfect by any means, but still well worth the watch, especially since it expands this world and gives us a reason to care for these characters in the best way imaginable.